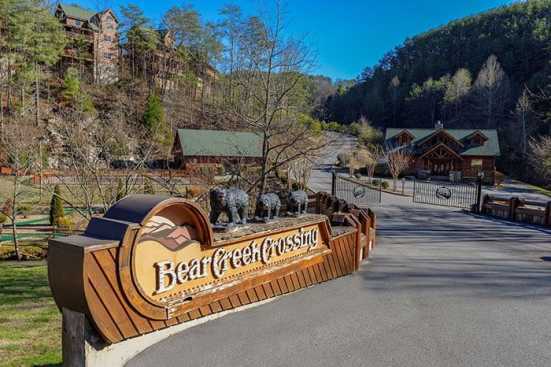 Welcome to Bear Creek Crossing, a beautiful cabin resort community in the foothills of Bluff Mountain in Pigeon Forge, Tennessee. Bear Creek Crossing offers a large four bedrooms, a four-and-a-half-bathroom cabin that comfortably sleeps up to twelve adults. Amenities include a free mini-golf course (balls and clubs not provided), both indoor and outdoor community pools, hot tub, wrap around deck with views of Bluff Mountain, game room with pool table, and wifi. The resort clubhouse offers rental space for throwing parties or group events. Located in the foothills of Bluff Mountain Bear Creek Crossing offers stunning views of the nature and forestry of the Smokies without having to leave your cabin. SmokyMountainsByOwners.com is the best place online to research and book your Eastern Tennessee vacation. Whether your climbing to the top of Bluff Mountain to overlook the Smoky Mountains or you spend the day shopping in Downtown Pigeon Forge groups of all ages are sure to have a great time. SMBYO.com aims to take the hassle out of planning and booking your vacation so all you must worry about is which adventure to go on first.